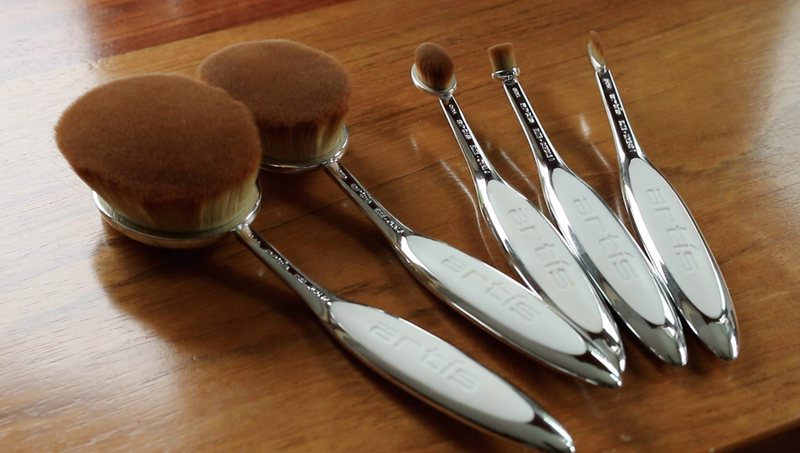 At long last, here is my review of the Artis brushes! Awesome for powder foundation, setting powder and body makeup! HUGE size that makes for very easy coverage of larger areas. A vintage feel in a beautiful new package! Perfect for liquid, cream or powder foundation application. Again, would be great for body makeup too. Great for blush or bronzer application as well as highlighter if you picked up product on one edge. Amazing for under-eye concealing and setting. Great for precision contour and highlighting. Makes quick work of eyeshadow primer application. Lovely for lip product application because of its shape and size. Great for spot correction of zits, moles or other "imperfections". I like this for inner corner highlight on the eyes but it can be used all over the eye area including the brow. Highlighting the center of the nose is super easy and quick with this, too. Precision brow strokes, carving out brows, eyeliner application and nose contouring. Can also be used for lip lining and cleaning up around the lip with concealer! Very ergonomic design making it perfect for self-application. Allows you to get closer to the mirror so perfect for people whose eyes aren't so helpful. They offer their own brush cleaning system but i've found regular daily brush cleanser and paper towel works well. Obviously i do a deep clean too with Dr Bronners bar soap, just squeeze out as much liquid as you can (gently) and hang to dry. Find Artis brushes here along with their youtube channel here.